Articles, news and training on how to successful market a child care program to achieve the greatest success. Promoting a nonprofit can be a bit on the tricky side, especially since you want to keep your costs to a minimum to ensure the most amount of money reaches the organization. Here are some great tools to help you promote your nonprofit in a cost effective manner. What a great tool at your fingertips and it doesn’t have to cost you anything. Use social media networks like Twitter, LinkedIn or Facebook, which are all free. There are other networks so make sure you search to find the ones that will work best for you to bring you targeted traffic. There are also cost effective advertising options that you can use. Establishing your nonprofit takes a lot of work and support. One way to get the momentum you need to get the word out about your nonprofit organization is to join the Chamber of Commerce in your area and find other professional networks you can take advantage of. Create a website that can reach a wide audience. Make sure it is done professionally and has been search engine optimized. If you want to create your own website, there are many affordable places that you can do that. If you do not tell anyone about your organization then how will they know about it? That means you need to be talking about it at every opportunity that comes your way. Speaking engagements are a great way to share information about your nonprofit. You might also create workshops or participate in trade shows or artisan fairs to share the word. Make sure that you do a press release for your local newspaper for every event that allows you to spread the word. Establish good partnerships to help you reach a broader audience. Nonprofits often use manpower and resources and you can create a better base to work from by creating strategic partnerships that help you create a strong presence. Don’t read everything. You simply can’t absorb everything that’s out there. Concentrate on prioritizing data, handing it off to someone who can decide whether you need to digest it, and discarding what’s not useful. Assess your information sources. Identify sources of information that are essential and trustworthy. Weed out any publication, website, or professional association whose information isn’t of the highest quality. Scan for information. When you open a publication or look at a website, skim before diving in. Focus only on articles or reports that you need to read, not what’s just mildly interesting to you. Stick to what’s important. Highlight the important stuff. As you read a book or magazine, highlight or underline key messages. Save online articles in a special folder, and check it every once in a while. If you haven’t gone back to any saved material, discard it. Be an example. If you don’t want to get bogged down by long emails or voice messages, keep your own short. Let others know that they should keep their information as concise as possible—and remind them when they don’t. Pictures are one of the greatest ways to reinforce your value to parents. No matter the size of your child care center, you should be taking photos and using them to promote your business, both to current clientele as well as prospects. Today I got the proof pictures from my daughter’s child care class photos. I’m just in love with these photos. These pictures will be going out to family for the holidays and great simple inexpensive gifts. And it is not just me, I’m sure the other parents will be doing the same thing. Portraits are a great benefit you can offer. It doesn’t matter the size of your daycare, you should be able to get something set up for a picture day. If you’re a small home daycare think about contacting the local college to find a top student, they may even do it as a project, or look for wedding photographers in the off season, they may do it to keep busy. Everybody loves seeing their little boys and girls all dressed up in a photograph for years to come. And doing it at your daycare saves the family the trouble of going to a portrait studio in the mall and will probably be cheaper for them too. What a great way to make parents happy and willing to refer your center to their friends, family, and co-workers. Taking pictures goes beyond portraits. Think about taking pictures of the fun things your kids are doing. Here’s a picture of my daughter with what started as finger painting. She loves to get into whatever she does. I just love this picture, it’s framed in hallway. This picture was just taken by the daycare staff and emailed to me. These pictures weren’t just sent to me, other parents get similar pictures when fun stuff happens. It allows parents to connect with their kids, and show them off. An inexpensive digital camera from Wal-Mart should cost you less than $50. That’s nothing when you look at what it will earn you: great reviews, referrals, great enrollment Plus you will likely be able to deduct the cost of the camera as an operating expense. Parents love to see how their kids are doing at daycare. Before now it’s been hard, the portraits, and maybe some fun shots now and then. But the internet is changing that fast. With the growth of cheap small digital web cam and high speed Internet connection you can now broadcast your days to all parents. The best example of this is a service called Share In My Day. With this service, everything is set up for you and parents are given a login and password to access the daycare’s online webcam from anywhere, anytime. They can check in and see what’s happening and watch the fun. This is a new technology and everywhere it goes in, parents just rave about it. Could you do something like this for your parents? Parents just love getting pictures of their kids. When you find unique and special ways to give them what they want, they will love you that much more. 6) Fill water bottles ¾ full the night before and freeze. Have the children make a name label put to on their bottles. Place the bottles in a box or on a tray outside and encourage the kids to drink 2-4 bottles of water each day. 8) Serve fruit smoothies, milkshakes or POPSICLES! 12) Encourage bathroom use before going outdoors to prevent children being unsupervised. 13) Create a separate list of outdoor rules i.e. No one leaves the yard, no climbing on the fence, no throwing except for balls, shoes off before reentering the house, etc. Go over the rules the first few days of outdoor play. 14) Do not apply bug repellent to the children unless authorized in writing and requested by parents. 15) If you have your home sprayed for pests, check to make sure that it is safe for children and pets and confirm what precautions you need to take when the children go outdoors after being sprayed. 16) Do not fertilize your plants or lawn during the week, do this on the weekend to allow time for the fertilizer to dissolve. 17) Encourage indoors toys to stay in and outdoor toys to stay out. 18) Offer fun yet messy activities such as sidewalk chalk, finger-painting and play dough. 19) Provide safe outdoor activities such as a child friendly play structure, sand box; ride on toys and balls. Set up sporting stations with a mini basketball hoop or cones for mini soccer games. 20) Keep a cellular or cordless phone outdoors so you can be available to parents as needed, while being able to supervise outdoor play at all times. Learn How to Create, Promote and Fill Your Summer Camp Programs. If you need help transforming your summer camp or program from a money-loser to a profit center, this program is for you! Through video training on DVD, along with a workbook and “swipe file” of summer marketing tools and examples, you will learn how to create a unique and special summer learning experience! Reduce waste in your summer marketing dollars and renew your entrepreneurial energy with this fantastic resource. Learn more here. One of the most import parts of running a child care center is effective marketing. Marketing can make or break your center, leaving you full with great profits or struggling to get by. I also know that you did not get into this business to focus on marketing and advertising your child care – you probably would much rather spend your time taking care of kids and playing with them. 🙂 So I’m in the process of creating a Child Care Marketing Toolkit & Success System that’s going to make it easy for you to keep your enrollment MAXED and even create a waiting list. My goal is to put together one of the greatest tools for child care marketing…everything you need all in one toolkit. I’ve spent several months putting this together, with real life examples from successful daycare businesses (homes and centers). If you would like to learn more check out my new page featuring The Childcare Marketing Toolkit. Nonprofits are no different than any other business type when it comes to increasing their brand exposure. One way to do this is to use video marketing. Videos can get your message across in different ways than other marketing methods. People like to watch videos – it’s a nice change of pace from the constant sea of text that constantly flows in front of our faces. Keep your videos short but to the point. If you have a long video that needs to be seen, break it up into smaller chunks or “chapters” that your viewers can watch at their own pace. Videos recorded by non-professionals give an air of imperfection and a human touch to your organization. Your donors and prospects will tend to believe your message more with this personal touch. You can also use videos to bring face-to-face events to your supporters giving your event a wider outreach. This gives what you’re doing and what you’re organizing more transparency. This is an exceptional point for organizations who are farther away. Daycare centers are a home-away-from-home for many children. Providers, both in centers and in homes, can take simple steps to make daycare facilities more happy, healthy, safe, and green. 1) Find the program that is right for you. 3) Complete the checklist. Comply with at least 20 of the 25 checklist items, including the 2 required items necessary for endorsement. 4) Verify your completed checklist. Ask a non-employee witness to confirm the completion of tasks. Once endorsed, you will receive materials to display your commitment to maintaining an eco-healthy child care facility, including a placard, informative poster, and official letter of endorsement to frame & display. Endorsed providers are listed on the Eco-Healthy Child Care website, which is visited by thousands of parents each year. Pesticides & Pest Prevention: Use non-toxic techniques both inside & out. If pesticide is your only option, use the least toxic product at a time when children will not be exposed to the area for at least 12 hours. Air Quality: No idling cars, no scented candles, no air fresheners, and no smoking anywhere on premises. Household Chemicals: Use biodegradable, non-toxic cleaning products, no aerosol sprays, and low-VOC latex paints. Lead: Use only cold water, follow lead paint guidelines, and do not use imported, old or handmade pottery to store, cook, or serve food or drinks. I’ve gotten lots of questions about how to set child care rates. Here are some rules of thumb and some “out of the box” ideas to help you improve your profits. Of course, you need to start out by understanding what your competitors are charging. This is the basis for setting your rates. Research what centers and homes are charging in your area, and then do an annual check to keep up with trends. I highly recommend that you set weekly rates and offer a small discount if people pay monthly. Getting monthly payments means less administration on your part, more stability, and it will improve your cashflow. You should NEVER charge on an hourly or daily basis. That’s the mindset and approach of a baby-sitter and you don’t want to be thought of as that. Child care centers charge by the week and/or month, not by the day or hour. Another rule of thumb is to try offering FEWER breaks on number of days. What this means is to offer one flat full-time rate for anything over 3 days / week, and one flat part-time rate for 3 days or less. So regardless of whether a child is in your care 4 or 5 days, the rate is the same. This is how Kindercare and others set their rates, and it will help your bottom line. It’s also easier to manage because you only have 2 rates per age group, not lots of different tiers. Another rule that centers follow is to charge the most for the youngest children (infants) and reduce fees slightly as kids get older. 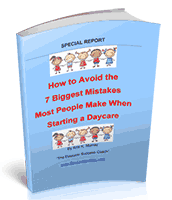 This is because the ratios of kids to caregivers is smaller for infants than it is for pre-K. People are fairly used to this type of tiered pricing by age group, so even if you’re a home daycare provider, this strategy could help improve your profits. Should You Wait to Start a Daycare…Due to the Economy? People ask me all the time whether it’s a good idea to start a daycare business in these tough economic times. 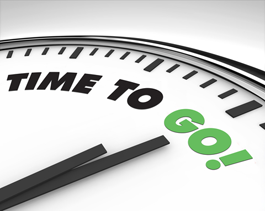 Truth is, this can be a GREAT time to start your new child care business…it just depends on your individual market, your financial position, and your mental attitude. Let’s talk more about each of these 3 success factors. Why is your individual market important? Well, you have to know whether your neighborhood or city is in need of more child care providers, or whether there’s an unmet need that you can tap into, such as second-shift care, before & after care, bilingual care, or some other untapped “niche market.” If you fill a need that people have been searching for, you will do FINE in this economy, because you’ll have an instant clientele and maybe even a waiting list. On the other hand, if there is too much supply and not enough demand in your area for child care, you’ll be starting an uphill battle. In any economy, it’s important to figure out how much money you’ll need to start your business, and make sure you have enough saved up, as well as some source of funds earmarked for an emergency. If you don’t have at least $3,000 to $5,000 saved, I would probably advise you to wait on your business start-up until you do. You can start a home-based daycare with as little as $1,000, but you’ll want to have a reserve in case it takes you longer than planned to build your clientele and have a full child care program. The third thing you need is the right mindset. You will face challenges during the start-up phase of your daycare business, so you’ll want to make sure you’re clear on WHY you are going into this business, and be able to get in touch with your deep desire and passion to make it work. If you’ve done your homework, you have some start-up funds saved, and you have the mindset, you’re going to succeed no matter how tough the economy gets. So what’s stopping you? I’m a NUT about direct response advertising, compared to traditional “brand” advertising, especially for daycare businesses. So exactly why is direct response so much better? Well, there are 2 main reasons why. The first reason is, direct response is 100% MEASURABLE, whereas regular brand advertising is not. The second reason is, direct response is a great way to get new prospects to contact you, and build a list of people interested in your programs and services. Regular brand ads just don’t do this as well. So what ‘s the difference between the two, anyway? Well, simply put, a direct response ad includes a unique phone number, URL, or offer that invites the reader or viewer to take action based on the OFFER in the ad itself. A typical brand ad just creates “impressions” or buzz about the product, but doesn’t present an offer for the prospect to take an action. One of the most targeted ways to use direct response is through direct mail. The reason direct mail is so targeted is the ability to purchase lists of potential recipients of your message based on all sorts of factors: where they live, ages of kids, income, what magazines they subscribe to, and MANY other factors. For example, if you want to fill up your infant room with new enrollments, you can literally get a list of expectant mothers and moms with infants in your town.